√ An assembly consists of one or more files (dlls, exe’s, html files etc. ), and represents a group of resources, type definitions, and implementations of those types. An assembly may also contain references to other assemblies. These resources, types and references are described in a block of data called a manifest. √ An assembly is completely self-describing.An assembly contains metadata information, which is used by the CLR for everything from type checking and security to actually invoking the components methods. As all information is in the assembly itself, it is independent of registry. This is the basic advantage as compared to COM where the version was stored in registry. √ Multiple versions can be deployed side by side in different folders. These different versions can execute at the same time without interfering with each other. Assemblies can be private or shared. For private assembly deployment, the assembly is copied to the same directory as the client program that references it. No registration is needed, and no fancy installation program is required. When the component is removed, no registry cleanup is needed, and no uninstall program is required. Just delete it from the hard drive. √ NameSpace Logically group types, example System.Web.UI logically groups our UI related features. √ In Object Oriented world many times its possible that programmers will use the same class name.By qualifying NameSpace with classname this collision can be avoided. √ Assembly is physical grouping of logical units. 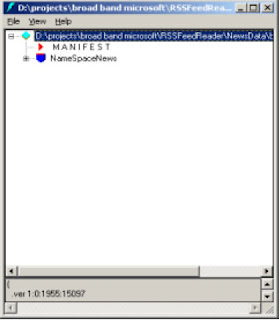 Namespace logically groups classes. √ Namespace can span multiple assembly. If you want to view a Assembly how do you go about it ? Twist : What is ILDASM ? When it comes to understanding of internals nothing can beat ILDASM. ILDASM basically converts the whole exe or dll in to IL code. To run ILDASM you have to go to "C:\Program Files\Microsoft Visual Studio .NET 2003\SDK\v1.1\Bin". Note that i had v1.1 you have to probably change it depending on the type of framework version you have. If you run IDASM.EXE from the path you will be popped with the IDASM exe program as shown in figure ILDASM. Click on file and browse to the respective directory for the DLL whose assembly you want to view. After you select the DLL you will be popped with a tree view details of the DLL as shown in figure ILDASM. On double clicking on manifest you will be able to view details of assembly, internal IL code etc as shown in Figure Manifest View. Note : The version number are in the manifest itself which is defined with the DLL or EXE thus making deployment much easier as compared to COM where the information was stored in registry. Note the version information in Figure Manifest view. You can expand the tree for detail information regarding the DLL like methods etc.